ITALIAN WALKING CLOSET SYSTEMS ARE COMING IN DIFFERENT SIZES: WIDTH, DEPTH, HEIGHT AND DIFFERENT FINISHES: GLOSS AND MATTE LACQUER, WOOD, GLASS, LEATHER. MATERIALS: ITALIAN WALKING CLOSETS ARE CONSTRUCTED USING PARTICLEBOARD OR MDF PANELS HAVING LOW FORMALDEHYDE EMISSION. THE GLASS USED IS TEMPERED OR LAMINATED TO INCREASE SAFETY IN THE EVENT OF ACCIDENTAL IMPACT. THE HARDWARE USED THROUGH THE SYSTEM IS THE RESULT OF RESEARCH FOCUSED ON IMPROVING ASSEMBLY AND MAINTENANCE AS WELL AS GUARANTEEING THE DURABILITY OF THE WHOLE PROGRAM. 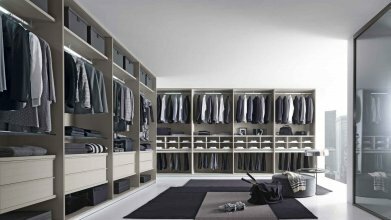 OUR WALKING CLOSET SYSTEMS OFFER THE POSSIBILITY OF INSTALLING ELECTRICAL SYSTEMS TO LIGHT UP THE INSIDE.